Share a printer locally and files & media with networked devices or remotely via FTP server. 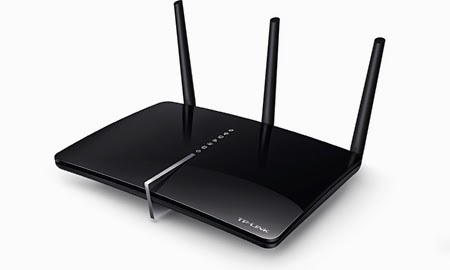 TP-LINK’s Archer D7 AC1750 Wireless Dual Band Gigabit ADSL2+ Modem Router is a combined wired/wireless network connection device with integrated wireless router and ADSL modem, reducing hassle of configuration and saving space. Featuring a variety of features and rich functionality, Archer D7 is the perfect hub of your home or business network. 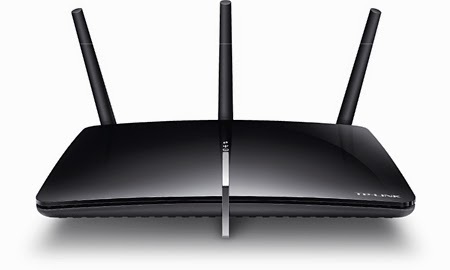 TP-LINK’s Archer D7 comes with the next generation Wi-Fi standard – 802.11ac, backward compatible with 802.11n and 3 times faster than wireless N speeds. With higher power efficiency and robust security, 802.11ac is the perfect way to accelerate a home multimedia network and solve congestion that multiple devices may cause. With 1.3Gbps wireless speeds over the crystal clear 5GHz band and 450Mbps over the 2.4GHz band, Archer D7 offers you the flexibility of two dedicated networks and ensures amazing wireless performance. Simple tasks such as sending e-mails or web browsing can be handled by the 2.4GHz band while bandwidth intensive tasks like online gaming or HD video streaming can be processed by the 5GHz band – all at the same time. With 3 detachable dual band external antennas combined with higher quality antenna technology, you can experience excellent wireless performance with high speed and stability. Furthermore, its high power amplifiers provide stronger signals in every direction with better coverage. This provides you with incredible wireless coverage and reliability from anywhere in your large home or office. 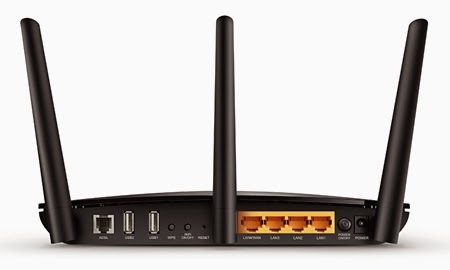 With one gigabit LAN/WAN port and 3 gigabit LAN ports, the Archer D7 is the ideal choice for bandwidth heavy users that rely on speedy, reliable connections for bandwidth intensive work or entertainment such as lag-free conference calls, HD video streaming or online gaming. Using the Archer D7’s two multi-functional USB 2.0 ports, you can share a printer with multiple computers and devices on your network and can also share files & media at home or via the ftp server while away from home. 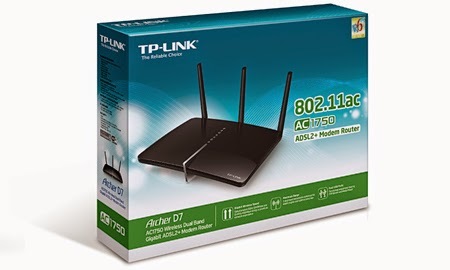 The Archer D7 supports ADSL or Ethernet WAN connections (EWAN), which allows users to have the flexibility of different Internet connections among ADSL, cable or fiber modem using its interchangeable LAN/WAN port. This unique feature makes it easier when users need to change to fiber or cable services when necessary. Included in the resource CD, TP-LINK's optimized configuration utility can help you complete the entire software installation and wireless network settings in just a few minutes. it's worth mentioning that with built-in intelligent auto-detection, Archer D7 is capable of automatically figuring out which connection type to use in a flash, saving you the trouble of searching for your connection information type and speeding up the setup process. Guest Network Access provides secure Wi-Fi access for guests sharing your home or office network in a controlled manner without needing to expose private Wi-Fi access codes or other personal data. Archer D7 supports IPv6, which is the foundation of the next generation of the Internet and enables a range of new services and improved user experience.